Daily Ummat newspaper is a famous urdu language most selling newspaper in Pakistan. Like daily jang and express newspaper this is also bought very much in Pakistan. 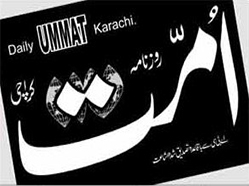 Online Daily Ummat Epaper version is bring out from karachi, sindh which enclose all the local and internationals new of karachi Pakistan. of Daily Ummat Newspapers's Chief editor is Rafique Afghan who is famous journalist of this newspaper and serving nation for many years. Ummat E paper Newspaper have pages on weekdays in which the readers find most of the news of karachi and sunday newspaper have has twelve pages to have much entertainment for you. All folks can read Daily Ummat Urdu NewsPaper Today Online here.